Before going into the details of Outlook vs Gmail, let’s clear some points. Nowadays, almost everyone has an Email address! Or, if that sounds too generalized, we can say that everyone connected to the Internet has an email address. When you create an email address, however, you are picking the email service also. Provided the fact that email is more or less your digital identity, it’s necessary to pick the right email service provider for you. And, that’s where the Outlook vs Gmail discussion arises. Outlook and Gmail are like many other competing products from Microsoft and Google. We mean products such as Google Drive and OneDrive. The game between Outlook and Gmail, however, is not simple. You cannot make a random selection because you may regret it later. In other words, you should know all the aspects of Gmail vs Outlook before you choose the email provider. Similarly, if you need a shift from an older email service – say, Yahoo, you need to compare these big bros. 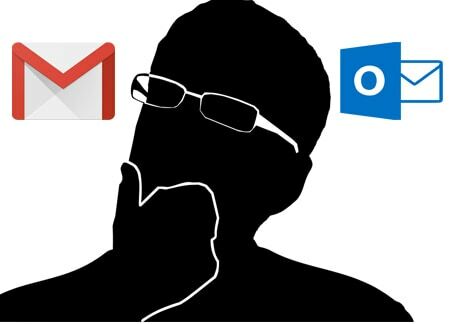 In this article, we shall have an in-depth comparison of Outlook vs Gmail. We can go through various sectors such as the User Interface, features and then come to a final decision. We hope this comparison will surely help many users out there. We can start with an introduction to both, especially for those who are completely new to Webmail Services. Let us start with Outlook first. So, what is Outlook? Outlook.com is the official email service from Microsoft. If you started web life quite earlier, you know this as Hotmail, which is one of the first webmail services to be ever made. In 2013, however, the name Hotmail was replaced by Outlook.com. Currently, if you register at Outlook.com, you will get an email ID like abhijith [at] outlook [dot] com. The service works in close integration with other Microsoft products such as OneDrive and Skype. It means that Outlook.com is relatively new to the game of email services, though it has a long history to talk about. Gmail, as you know, one of the prominent services from Google. Publicly launched in 2007, Gmail has been quite popular ever since – for secure webmail as well as third-party mailing services. Gmail works in integration with a Google account as well as other Google services. That is, you can integrate services such as Google Drive, Google Contacts, Google+, Calendar etc for better features. 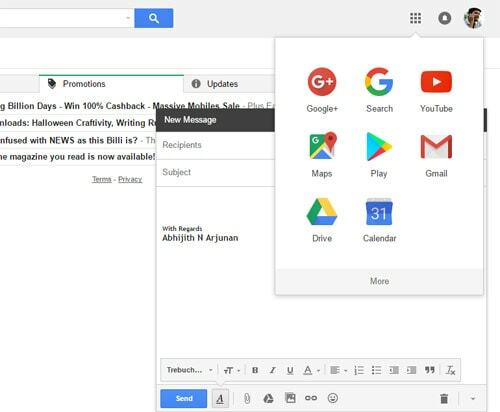 Indeed, it has many distinctive features and we have also shared some cool Gmail Tips that will really improve the way you use Gmail. In short, Gmail account seems to be the single gateway to almost all services available from Google. In addition, it is worth noting that Gmail is available for public use as well as in Google Apps package. P.S. It needs to be noted that we are referring to Outlook.com when we say Outlook. As you know, Microsoft has one product named Outlook, which is an email management client for Windows. Here, however, we are comparing the email service. User Interface is indeed a prominent factor when it comes to an email service. Depending on the number of emails you’d like to open, it becomes more and more important. As the first concern, we will go through the User Interface of Outlook and Gmail. Outlook.com User Interface is pretty simple, being inspired by Microsoft Metro Design Philosophy. The design is modern, clean and minimalistic. As you can see in the pictures, there is a list of emails in the Inbox and clicking on one will lead you to the email message. There too, standard options such as Delete, Archive, Junk, Move, Categories etc are visible. It offers a full-screen emailing experience – whether you are reading an email or writing one. Thanks to the clean arrangements, Outlook.com gets loaded in a few seconds, given that you’re logged in. 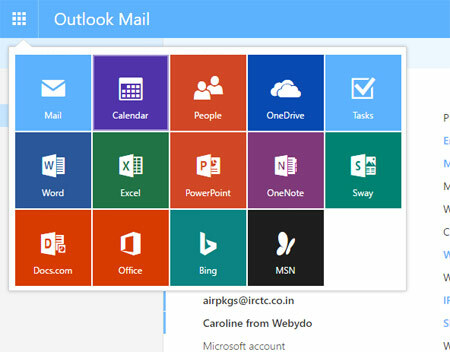 In short, if you are someone who loves clean UIs and simple access, you will definitely love Outlook.com Email. As we come to the case of Gmail, however, the User Interface is undoubtedly the optimal one. Google has kept a mixture of simplicity and product design in the UI. The best part of Gmail Interface is the customizability. Depending on a number of emails you want to see, you can customize the looks and layout of your Gmail interface. And, if that is not enough, it’s coming with the ming support. You can set background images or get entirely different themes. By the way, one thing to be noted here is that you can use Chrome extensions to modify the looks and layout of Gmail. For instance, there is one extension that brings tabbed style into Gmail. In short, we have much more reasons to go with Gmail, at least in the case of User Interface. Organizing your emails is an integral part of quick access. And, we will see what are the take of Gmail and Outlook on this aspect. Being frank, Outlook.com does not offer many options for email categorization. As we said, all your emails will appear on the single page. The only option you have in the interface is a color-based categorization. You can add email messages into categories such as Red, Yellow, Orange, Green and Blue. You can, however, create new folders in Outlook and move emails into those. Apart from these basic features, there aren’t any notable categorization features in Outlook. If allowed to exaggerate a bit, we will call Gmail the God of email categorization. Instead of showing all the emails into a single interface, there are five categories – Primary, Social, Promotions, Updates and Forums. Thanks to Gmail’s machine learning and AI techniques, emails are sorted and brought into corresponding folders. For instance, you will find all your personal emails in the Primary folder. What’s more, you can teach Gmail that some conversations are important and the same will be present on Primary. Another feature of Gmail is with the meaningful labels. 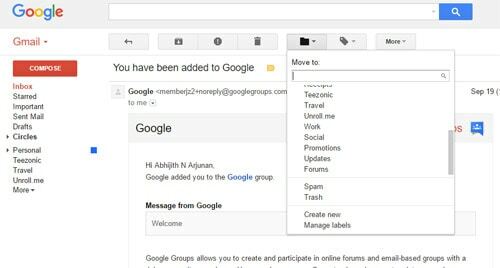 We had covered the best uses of Gmail labels in our last post of Gmail tips. Conclusively, it’s clear that Gmail has better options of email categorization. And the features of Outlook.com are not even nearby those of Gmail. We should have a look on the accessibility aspect of both Gmail and Outlook.com. As in the case of Outlook.com, smartphone apps are available for Android and iOS. As you have guessed, Windows 10 Phones has Outlook app in-built. We have tried the Android version and it is pretty simple to use. According to the user reviews, the iOS version of Outlook.com is also awesome. In addition, it is having a web-based version that you can access from any web mobile web browser. Also, for Windows 10 users, you can get the official app from Windows App Store. In short, we think it covers everything. Gmail apps are also available for Android and iOS and they are simply awesome. The best part is that Gmail is now offering support for your Outlook account. That is, you can simply connect your Outlook.com account and receive emails from the Gmail app itself. Quite notably, the user interface of Gmail Mobile Site is simply superb. At the least, you do not have to worry about the compatibility factor. 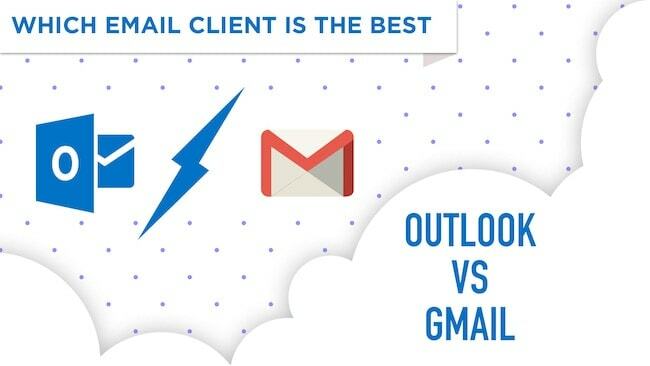 Basically, it’s a tie between Outlook vs Gmail. If you use your email account for sending huge files and stuff, you should be concerned about storage space as well as the further limits. Outlook does not have its clear words on the storage space offered. Some are of an opinion that the storage space is 5GB, while others consider it Unlimited. However, quite notably, there is a 35MB size limit on the attachments. At the maximum level, you can send a file that weighs 35MB. However, there should be no limit on the size of the files that you attach from OneDrive Storage or others like Box or Google Drive. In Gmail, the storage space is pretty satisfactory. You get a storage space of 15GB, which is something cool. However, it’s to be noted that the same 15GB will be used for Google Drive and Google Photos at the same time. When it comes to the case of attachment size, the limit is 25MB. This might be an issue while sending photographs or videos via email. 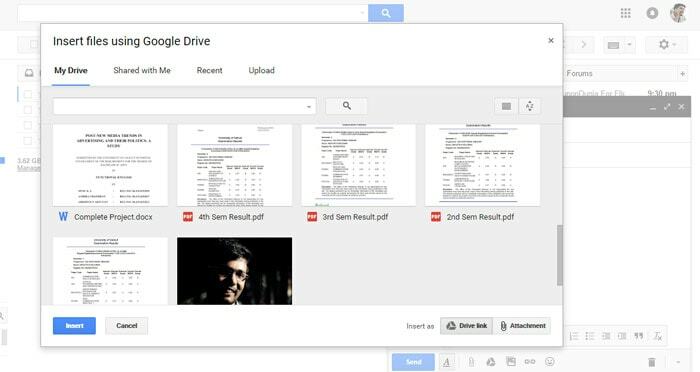 Despite this limitation, we love the Gmail integration with Google Drive. You can simply link the corresponding file from G-Drive. Summing up, it’s a good thing that Gmail provides 15GB of storage space, although it’s spread across G-Drive and Photos. So, we have reasons to go with this. This is where the real selection gets. It depends on what you use and how you use Digital services. Being a Microsoft product, Outlook.com has a better level integration with Microsoft services such as OneDrive, Skype as well as Bing, if you prefer that. 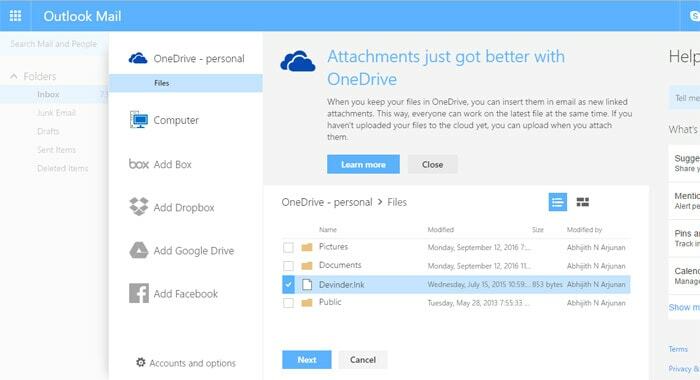 For instance, you can add email attachments from OneDrive and there’s a good support to Office documents as well. If you are someone who needs to manage a lot of documents via email, Office Online integration is an awesome feature. Despite all these, for common users who depend on Android or iOS Devices, Outlook.com may not be that appealing. By the way, quite recently, we have been some third-party integrations as well. For instance, you’ll be able to convert your email message into an Evernote note in a single click. It means the integration section is growing. In the Gmail vs Outlook battle, this is where Gmail leads ahead. As you know, Google services have become more of some necessity for most internet users. Just think this way; you have an Android device, with all the contacts synced with the web; you also have some documents made using Google Docs; and, for every other need, you use some Google product. If that is the scenario, you have enough reason to go with Gmail. As you know, there are pretty cool integrations with Google – let that be Google+, Docs, Contacts, Android or Google Drive. Everywhere, the Gmail address is enough. By the way, as we had told you earlier, you can use some Chrome extensions and services to improve Gmail functionalities. We think the point is clear. For most, Gmail makes sense. By the way, if you use Bing and OneDrive instead, you’d know what to do. So, we have covered the five important aspects for both Gmail vs Outlook. Before that, we had answered what is Outlook and Gmail for basic users out there. Now, it should be clear to you the distinctive features of both services, from two different tech giants. And, let’s take decisions now. Before that, we need to mention that both Gmail and Outlook.com show advertisements in the interface. In Outlook, however, you can pay an extra amount of $19.95 per year to have an ad-free Outlook experience. If you need an ultra-minimal User Interface with standard features, you can go with Outlook.com. As of now, Outlook does not offer any meaningful integrations or extensions. However, we can expect them in the near-future. In the meantime, you can have the benefits of OneDrive Integration and Contacts, if you own a Windows 10 Phone. In comparison, it does not offer many options for email categorization either. So, we repeat, Outlook.com is for those who prefer simple stuff. On the other hand, if you need an email service that does the whole job, Gmail seems viable. We should consider the fact that Gmail comes with better Google products integration. You can access a variety of data such as Google Drive, Photos, Contacts etc right from the inbox. And, as we said, Gmail account is your gateway to Google. Also, when compared to the other, Gmail offers folder-wise mail categorization, advanced sending options etc. For instance, we had covered some of those simple yet effective Google tips lately. So, for those who need productive emailing experience, Gmail offers a lot. 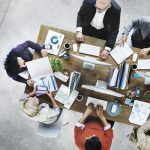 It is also worth noting that you can bring the same Gmail experience to your organization with the help of Google Apps for Business. It can give you a streamlined business email experience too. In the end, while summing up, Gmail seems to be the better choice for most users. In the exceptional case, if you use a lot of Microsoft products, you should go with Outlook.com. Otherwise, hail Gmail, hail. I always give green signal to Gmail always cool and easy to use . I love Gmail, and I use it for every business email I own. Moreover, Google apps like documents, sheets, GDrive, etc., make it totally unresistible. Hi Shafi, you are right, Google is irresistible and not only you, we all love Google. In fact, you can check our article, https://www.techlila.com/i-love-you-google/ for why millions and the millions of people love Google. Although Outlook has been quite my personal choice, due to the transformation history attached to it (like moving from Hotmail), yet Gmail has been exceedingly helpful. Can’t agree with you more for sure. I love Gmail and it is better than any other email services. I like Gmail. But what about the accusation made that Google mines every information about you, in other words, your privacy is violated? Trust me, online privacy is a complete myth.